Engraving The Confusion of Tongues by Gustave Doré (1865), who based his conception on the Minaret of Samarra. According to Genesis Chapter 11 of the Bible, the Tower of Babel (Hebrew: מגדל בבל Migdal Bavel) was a tower built to reach the heavens by a united humanity. God, observing the arrogance of humanity, resolves to confuse the previously uniform language of humanity, thereby preventing any such future efforts. The tower's destruction is not described in Genesis, but is mentioned in the Book of Jubilees, and elsewhere. The normal interpretive account of the story, as found, for example, in Flavius Josephus, explains the tower's destruction in terms of humankind's deficiency in comparison to God: Within a religious framework, humankind is considered to be an inherently flawed creation dependent on a perfect being for its existence, and thus, the construction of the tower is a potentially hubristic act of defiance towards the God that created them. As a result, this story is often used within a religious context to explain the existence of many different languages. 1 And the whole earth was of one language, and of one speech. 2 And it came to pass, as they journeyed from the east, that they found a plain in the land of Shinar; and they dwelt there. 3 And they said one to another, Come, let us make brick, and burn them thoroughly. And they had brick for stone, and slime had they for mortar. 4 And they said, Come, let us build us a city and a tower, whose top may reach unto heaven; and let us make us a name, lest we be scattered abroad upon the face of the whole earth. 5 And the Lord came down to see the city and the tower, which the children builded. 6 And the Lord said, "If as one people speaking the same language they have begun to do this, then nothing they plan to do will be impossible for them. 7 Come, let us go down, and there confound their language, that they may not understand one another's speech. 8 So the Lord scattered them abroad from thence upon the face of all the earth: and they left off to build the city. 9 Therefore is the name of it called Babel (confusion); because the Lord did there confound the language of all the earth: and from thence did the Lord scatter them abroad upon the face of all the earth. The Greek form of the name is from the native Akkadian Bāb-ilim, which means "Gate of the god." This correctly summarizes the religious purpose of the great temple towers (the ziggurats) of ancient Sumer (which many believe to be Biblical Shinar in modern southern Iraq). These huge, squared-off stepped temples were intended as gateways for the gods to come to earth, literal stairways to heaven. "Reaching heaven" is a common description in temple tower inscriptions. This is the type of structure referred to in the Biblical narrative, though artists and biblical scholars envisioned the tower in many different ways. Pieter Brueghel's influential portrayal is based on the Colosseum in Rome, while later conical depictions of the tower (as depicted in Doré's illustration) resemble much later Muslim towers observed by nineteenth century explorers in the area, notably the Minaret of Samarra. M.C. Escher depicts a more stylized geometrical structure in his woodcut representation of the story. Ziggurats are among the largest religious structures ever built. Some suppose that the Biblical narrative is a reaction to the ancient Mesopotamian system of beliefs reflected in these impressive structures—beliefs that ruled the hearts and minds of some of the greatest civilizations of ancient times. The Hebrew version of the name of the city and the tower, Bavel, is attributed, in Gen. 11:9, to the verb balal, which means "to confuse or confound" in Hebrew. The ruins of the ancient city of Babylon can be found near the city of Hillah, in modern-day Iraq, in the province of Babil, approximately 60 miles south of Baghdad. 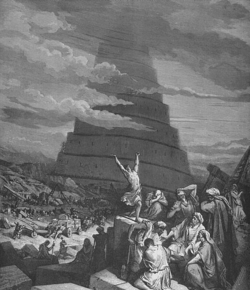 According to the documentary hypothesis, the passage is derived from the Jahwist source, a writer whose work is full of puns and like many of the other puns in the Jahwist text, the element of the story concerning the scattering of languages is thought by many to be a folk etymology for the name Babel, attached to a story of a collapsing tower. Historical linguistics has long wrestled with the idea of a single original language. Attempts to identify this language with a currently existing language have been rejected by the academic community. This was the case with Hebrew and with Basque (as proposed by Manuel de Larramendi). Yet, the well-documented branching of languages from common ancestors (such as most current European languages from ancient Indo-European) points in the direction of a single ancestral language. The main issue of dispute is the date, which most modern scholars would put several thousand years before the traditional date for the demise of the Tower of Babel. A large construction project in the ancient world might have used pressed labor from a diverse set of conquered or subject populations and the domain of the empires covering Babylon would have contained some non-Semitic languages, such as Hurrian, Kassite, Sumerian, and Elamite, among others. 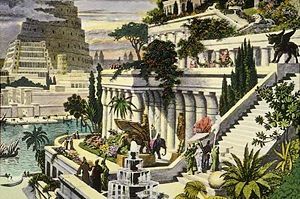 The Tower of Babel in the background of a depiction of the Hanging Gardens of Babylon by Martin Heemskerck. In Genesis 10, Babel is said to have formed part of Nimrod's kingdom. It is not specifically mentioned in the Bible that he ordered the tower to be built, but Nimrod is often associated with its construction in other sources. There is a Sumerian myth similar to that of the Tower of Babel, called Enmerkar and the Lord of Aratta, where Enmerkar of Uruk is building a massive ziggurat in Eridu and demands a tribute of precious materials from Aratta for its construction, at one point reciting an incantation imploring the god Enki to restore (or in Kramer's translation, to disrupt) the linguistic unity of the inhabited regions—named as Shubur, Hamazi, Sumer, Uri-ki (the region around Akkad), and the Martu land. One recent theory first advanced by David Rohl associates Nimrod, the hunter, builder of Erech and Babel, with Enmerkar (that is, Enmer the Hunter) king of Uruk, also said to have been the first builder of the Eridu temple. (Amar-Sin (c. 2046-2037 B.C.E. ), third monarch of the Third Dynasty of Ur, later attempted to complete the Eridu ziggurat.) This theory proposes that the actual remains of the Tower of Babel are, in fact, the much older ruins of the ziggurat of Eridu, just south of Ur, rather than those of Babylon, where the story was later transposed. Among the reasons for this association are the larger size of the ruins, the older age of the ruins, and the fact that one title of Eridu was NUN.KI ("mighty place"), which later became a title of Babylon. Both cities also had temples called the "E-Sagila." Traditionally, the peoples listed in Chapter 10 of Genesis (the Table of Nations) are understood to have been scattered over the face of the earth from Shinar only after the abandonment of The Tower, which follows as an explanation of this cultural diversity. Some, however, see an internal contradiction between the mention already in Genesis 10:5 that "From these the maritime peoples spread out into their territories by their clans within their nations, each with his own language" and the subsequent Babel story, which begins, "Now the entire earth was of one language and uniform words" (Genesis 11:1). Others answer this claim with the fact Genesis is listing the descendants of Noah's son, Japheth, not stating a time period as much as referring to separate cultures. They claim that there is no reason to presuppose these descendants had developed their own languages prior to the Tower's construction. Babylon's outer wall is the main defense of the city. There is, however, a second inner wall, of less thickness than the first, but very little inferior to it in strength. The center of each division of the town was occupied by a fortress. In the one stood the palace of the kings, surrounded by a wall of great strength and size: In the other was the sacred precinct of Jupiter (Zeus) Belus, a square enclosure two furlongs [402 m] each way, with gates of solid brass; which was also remaining in my time. In the middle of the precinct there was a tower of solid masonry, a furlong [201 m] in length and breadth, upon which was raised a second tower, and on that a third, and so on up to eight. The ascent to the top is on the outside, by a path which winds round all the towers. When one is about half-way up, one finds a resting-place and seats, where persons are wont to sit some time on their way to the summit. On the topmost tower there is a spacious temple, and inside the temple stands a couch of unusual size, richly adorned, with a golden table by its side. There is no statue of any kind set up in the place, nor is the chamber occupied of nights by any one but a single native woman, who, as the Chaldeans, the priests of this god, affirm, is chosen for himself by the deity out of all the women of the land. This Tower of Jupiter Belus is believed to refer to the Akkadian god Bel, whose name has been hellenized by Herodotus to Zeus Belus. It is likely that it corresponds to the giant ziggurat to Marduk (Etemenanki), an ancient ziggurat which was abandoned, falling into ruin due to earthquakes and lightning damaging the clay. This huge ziggurat, and its downfall, is thought by many academics to have inspired the story of the Tower of Babel. However, it would also fit nicely into the Biblical narrative—providing some archaeological support for the story. More evidence can be gleaned from what King Nebuchadnezzar inscribed on the ruins of this ziggurat. A former king built [the Temple of the Seven Lights of the Earth], but he did not complete its head. Since a remote time, people had abandoned it, without order expressing their words. Since that time earthquakes and lightning had dispersed its sun-dried clay; the bricks of the casing had split, and the earth of the interior had been scattered in heaps. Merodach, the great lord, excited my mind to repair this building. I did not change the site, nor did I take away the foundation stone as it had been in former times. So I founded it, I made it; as it had been in ancient days, I so exalted the summit. It is not mentioned in the Genesis account that God directly destroyed the tower; however, the accounts in the Book of Jubilees, Cornelius Alexander (frag. 10), Abydenus (frags. 5 and 6), Josephus (Antiquities 1.4.3) and the Sibylline Oracles (iii. 117-129) do state the tradition that God overturned the tower with a great wind. The Book of Jubilees, known to have been in use between at least 200 B.C.E. and 90 C.E., contains one of the most detailed accounts found anywhere of the Tower. And they began to build and in the fourth week they made brick with fire and the bricks served them for stone and the clay with which they cemented them together was asphalt which comes out of the sea and out of the fountains of water in the land of Shinar. And they built it: Forty and three years were they building it; its breadth was 203 bricks, and the height [of a brick] was the third of one; its height amounted to 5433 cubits and 2 palms, and [the extent of one wall was] thirteen stades [and of the other thirty stades] (Jubilees 10:20-21, Charles' 1913 translation). Rabbinic literature offers many different accounts of other causes for building the Tower of Babel and of the intentions of its builders. It was regarded in the Mishnah as a rebellion against God. Some later midrash record that the builders of the Tower, called "the generation of secession" in the Jewish sources, said: "God has no right to choose the upper world for Himself and to leave the lower world to us; therefore we will build us a tower, with an idol on the top holding a sword, so that it may appear as if it intended to war with God" (Gen. R. xxxviii. 7; Tan., ed. Buber, Noah, xxvii. et seq.). The building of the Tower was meant to bid defiance not only to God, but also to Abraham, who exhorted the builders to reverence. The passage mentions that the builders spoke sharp words against God, not cited in the Bible, saying that once every 1,656 years, heaven tottered so that the water poured down upon the earth, therefore they would support it by columns that there might not be another deluge (Gen. R. l.c. ; Tan. l.c.). Some among that sinful generation even wanted to war against God in heaven (Talmud Sanhedrin 109a). They were encouraged in this wild undertaking by the notion that arrows which they shot into the sky fell back dripping with blood, so that the people really believed that they could wage war against the inhabitants of the heavens (Sefer ha-Yashar, Noah, ed. Leghorn, 12b). According to Josephus and Midrash Pirke R. El. xxiv., it was mainly Nimrod who persuaded his contemporaries to build the Tower, while other rabbinical sources assert, on the contrary, that Nimrod separated from the builders. 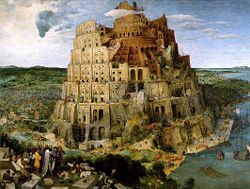 Some Kabbalistic mystics provide most intriguing and unusual descriptions of the Tower of Babel. According to Menachem Tsioni, an Italian Torah commentator of fifteenth century, the Tower was a functional flying craft, empowered by some powerful magic or technology; the device was originally intended for holy purposes, but was later misused in order to gain control over the whole world. Isaac of Acre wrote that the Tower builders had reached, or at least planned to reach the distance of 2,360,000,000 parsas, or 9-10 billion kilometers above the Earth surface, which is about the radius of the Solar System, including most Trans-Neptunian objects. Similar accounts are also found in the writing of Jonathan Eybeschutz and the ancient book Brith Menuchah according to which, the builders of the Tower planned to equip it with some shield technology ("shielding wings") and powerful weapons. Many Kabbalists believed that the ancient peoples possessed magic knowledge of the Nephilim, which allowed them to construct such powerful devices. Moreover, according to some commentaries, some Talmudic sages possessed a manual for building such a flying tower. Quite oddly, these accounts coincide with some of Zecharia Sitchin's speculations and the ufological theories concerning the ancient Indian vimanas. According to another mysterious Kabbalistic account, one third of the Tower builders were punished by being turned into various semi-demonic creatures and banished into three parallel dimensions, inhabited now by their descendants. Those who gave counsel to build the tower, for they whom thou seest drove forth multitudes of both men and women, to make bricks; among whom, a woman making bricks was not allowed to be released in the hour of child-birth, but brought forth while she was making bricks and carried her child in her apron and continued to make bricks. And the Lord appeared to them and confused their speech, when they had built the tower to the height of four hundred and sixty-three cubits. And they took a gimlet and sought to pierce the heavens, saying, Let us see (whether) the heaven is made of clay, or of brass, or of iron. When God saw this He did not permit them, but smote them with blindness and confusion of speech and rendered them as thou seest (Greek Apocalypse of Baruch, 3:5-8). Though not mentioned by name, the Qur'an has a story with similarities to the Biblical story of the Tower of Babel, though set in the Egypt of Moses. In Suras 28:38 and 40:36-37, Pharaoh asks Haman to build him a clay tower so that he can mount up to heaven and confront the God of Moses. Another story, in Sura 2:102, mentions the name of Babil, but tells of when two angels taught the people of Babylon the tricks of magic and warned them that magic is a sin and that their teaching them magic is a test of faith. A tale about Babil appears more fully in the writings of Yaqut (i, 448 f.) and the Lisan el-'Arab (xiii. 72), but without the tower: Humankind were swept together by winds into the plain that was afterwards called "Babil," where they were assigned their separate languages by Allah, and were then scattered again in the same way. In the History of the Prophets and Kings, by the ninth century, Muslim historian al-Tabari, a fuller version is given: Nimrod has the tower built in Babil, Allah destroys it, and the language of humankind, formerly Syriac, is then confused into 72 languages. Another Muslim historian of the thirteenth century, Abu al-Fida, relates the same story, adding that the patriarch Eber (an ancestor of Abraham) was allowed to keep the original tongue, Hebrew in this case, because he would not partake in the building. Various traditions similar to that of the tower of Babel are found in Central America. One holds that Xelhua, one of the seven giants rescued from the deluge, built the Great Pyramid of Cholula in order to storm Heaven. The gods destroyed it with fire and confounded the language of the builders. The Dominican friar, Diego Duran (1537-1588), reported hearing this account from a hundred-year-old priest at Cholula, shortly after the conquest of Mexico. Members of the Church of Jesus Christ of Latter Days Saints (Mormons) have an explicit reference to the building of the Tower of Babel and the confounding of languages in the Book of Mormon, in which a man named Jared and his family is warned by God about the destruction. Their language is preserved and they are led across the sea into America. Another story, attributed by the native historian Don Ferdinand d'Alva Ixtilxochitl (c. 1565-1648) to the ancient Toltecs, states that after humans had multiplied following a great deluge, they erected a tall zacuali or tower, to preserve themselves in the event of a second deluge. However, their languages were confounded and they went to separate parts of the earth. Still another story, attributed to the Tohono O'odham Indians, holds that Montezuma escaped a great flood, then became wicked and attempted to build a house reaching to heaven, but the Great Spirit destroyed it with thunderbolts. According to Dr. Livingstone, the Africans whom he met living near Lake Ngami in 1879, had such a tradition, but with the builders' heads getting "cracked by the fall of the scaffolding" (Missionary Travels, chap. 26). James George Frazer has identified Livingston's account with a tale found in Lozi mythology, wherein the wicked men build a tower of masts to pursue the Creator-God, Nyambe, who has fled to Heaven on a spider-web, but the men perish when the masts collapse. He further relates similar tales of the Ashanti that substitute a pile of porridge pestles for the masts. Frazer, moreover, cites such legends found among the Kongo people, as well as in Tanzania, where the men stack poles or trees in a failed attempt to reach the moon. Traces of a somewhat similar story have also been reported among the Tharus of Nepal and northern India (Report of the Census of Bengal, 1872, p. 160), as well as the Karbi and Kuki people of Assam (Frazer). The traditions of the Karen people of Myanmar, which Frazer considered to show clear "Abrahamic" influence, also relate that their ancestors migrated there following the abandonment of a great pagoda in the land of the Karenni 30 generations from Adam, when the languages were confused and the Karen separated from the Karenni. He notes yet another version current in the Admiralty Islands, where humankind's languages are confused following a failed attempt to build houses reaching to heaven. There have also been a number of traditions around the world that describe a divine confusion of the one original language into several, albeit without any tower. Aside from the ancient Greek myth that Hermes confused the languages, causing Zeus to give his throne to Phoroneus, Frazer specifically mentions such accounts among the Wasania of Kenya, the Kacha Naga people of Assam, the inhabitants of Encounter Bay in Australia, the Maidu of California, the Tlingit of Alaska, and the K'iche' of Guatemala. The Estonian myth of "the Cooking of Languages" has also been compared. According to one modern legend, "sack" was the last word uttered before the confusion of languages. The height of the tower is largely a matter of speculation, but since the tower symbolically can be considered a precursor to humankind's desire to build tall structures throughout history, its height is a significant aspect of it. The tower commissioned by Nebuchadnezzar in about 560 B.C.E., in the form of an eight-level ziggurat is believed by historians to have been about 100 meters (328 feet) in height. The narrative in the book of Genesis does not mention how tall the Biblical tower was and it has traditionally not been much of a subject of debate. There are, however, relevant extra-canonical sources. The Book of Jubilees mentions the tower's height as being 5433 cubits and 2 palms (8,150 feet, 2,484 meters high), or nearly 2.5 kilometers, several times taller than the tallest modern structures. The Third Apocalypse of Baruch mentions that the "tower of strife" reached a height of 463 cubits (694 feet and 6 inches, 212 meters high), taller than any other structure built in the ancient world, including the Pyramid of Cheops in Giza, Egypt, and taller than any structure built in human history until the construction of the Eiffel Tower in 1889.
laid out foursquare on a very level plain. Its wall, made of baked brick cemented with pitch, is fifty cubits wide, two hundred high, and four hundred and seventy stades in circumference. A stade contains five agripennes. Twenty-five gates are situated on each side, which make in all one hundred. The doors of these gates, which are of wonderful size, are cast in bronze. The same historian (Orosius) tells many other tales of this city, and says: "Although such was the glory of its building still it was conquered and destroyed." A typical medieval account is given by Giovanni Villani (1300): He relates that, "it measured eighty miles round and it was already 4,000 paces high and 1,000 paces thick and each pace is three of our feet." The fourteenth century traveler, John Mandeville, also included an account of the tower and reported that its height had been 64 furlongs (roughly 8 miles), according to the local inhabitants. The seventeenth century historian, Verstegan, provides yet another figure—quoting Isidore, he says that the tower was 5164 paces high, about 7.6 kilometers, and quoting Josephus that the tower was wider than it was high, more like a mountain than a tower. He also quotes unnamed authors who say that the spiral path was so wide that it contained lodgings for workers and animals, and other authors who claim that the path was wide enough to have fields for growing grain for the animals used in the construction. brick and stone weigh about 120 lb per cubic foot (2000 kg per cubic metre) and the crushing strength of these materials is generally rather better than 6000 lbf per square inch or 40 megapascals. Elementary arithmetic shows that a tower with parallel walls could have been built to a height of 7000 feet or 2 kilometers before the bricks at the bottom were crushed. However by making the walls taper towards the top they … could well have been built to a height where the men of Shinnar would run short of oxygen and had difficulty in breathing before the brick walls crushed beneath their own dead weight. 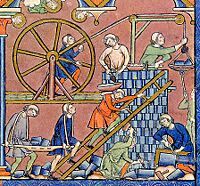 There are several medieval historiographic accounts that attempt to make an enumeration of the languages scattered at the Tower of Babel. Because a count of all the descendants of Noah listed by name in chapter 10 of Genesis (LXX) provides 15 names for Japheth's descendants, 30 for Ham's and 27 for Shem's, these figures became established as the 72 languages resulting from the confusion at Babel—although the exact listing of these languages tended to vary over time (The LXX Bible has two additional names, Elisa and Cainan, not found in the Masoretic text of this chapter, so early rabbinic traditions such as the Mishna speak instead of "70 languages"). Some of the earliest sources for 72 (sometimes 73) languages are the second century Christian writers Clement of Alexandria (Stromata I, 21) and Hippolytus of Rome (On the Psalms 9); it is repeated in Epiphanius of Salamis' Panarion (c. 375 C.E.) and St. Augustine's The City of God 16.6 (c. 410). Isidore of Seville in his Etymologiae (c. 635) mentions the number of 72, however his list of names from the Bible drops the sons of Joktan and substitutes the sons of Abraham and Lot, resulting in only about 56 names total; he then appends a list of some of the nations known in his own day, such as the Longobards and the Franks. This listing was to prove quite influential on later accounts which made the Lombards and Franks themselves into eponymous grandsons of Japheth; for example, the Irish monastic works Auraicept na n-Éces and the eleventh century Lebor Gabála Érenn, and the midrashic Book of Jasher. Other sources that mention 72 (or 70) languages scattered from Babel are History of the Prophets and Kings by Muhammad ibn Jarir al-Tabari (ninth century); the Anglo-Saxon dialogue, Solomon and Saturn; the Jewish Kabbalistic work Bahir (1174); the Prose Edda of Snorri Sturluson (c. 1200); the Gesta Hunnorum et Hungarorum (c. 1284; mentions 22 for Shem, 31 for Ham and 17 for Japheth for a total of 70); Villani's 1300 account; and the rabbinic Midrash ha-Gadol (fourteenth century). Villani adds that it "was begun 700 years after the Flood and there were 2,354 years from the beginning of the world to the confusion of the Tower of Babel. And we find that they were 107 years working at it; and men lived long in those times." According to the Gesta Hunnorum et Hungarorum, however the project was begun only 200 years following the Deluge. The tradition of 72 languages persisted into later times. Both José de Acosta in his 1576 treatise, De procuranda indorum salute, and António Vieira a century later in his Sermão da Epifania, expressed amazement at how much this "number of tongues" could be surpassed, there being hundreds of mutually unintelligible languages indigenous only to Peru and Brazil, respectively. ↑ George Rawlinson (ed. ), The History of Herodotus (New York: D. Appleton and Company, 1885). ↑ Josephus, Antiquities of the Jews. Retrieved November 20, 2007. ↑ www.hebrew.grimoar.cz, ספר ברית מנוחה. Retrieved November 24, 2007. ↑ Louis Ginzberg, Legends of the Jews, About.com: Classic Literature. Retrieved November 24, 2007. ↑ scriptures.lds.org, Ether. Retrieved November 24, 2007. ↑ J.G. Frazer, Folk-Lore in the Old Testament (New York: Macmillan, 1918). ↑ Johann Georg Kohl, Reisen in die 'Ostseeprovinzen (Dresden: U. Leipzig Arnold, 1842). ↑ Betty Kirkpatrick (ed. ), Brewer's Concise Dictionary of Phrase and Fable (London: Cassell, 1992, ISBN 9780304340798). ↑ Elfin Spell, How through the confusion of the Tower of Babel the world began to be inhabited. Retrieved November 20, 2007. Bancroft, H.H. Native Races of the Pacific States. New York: D. Appleton and Co., 1874. Cheever, John. The Stories of John Cheever. New York: Knopf, 1978. ISBN 9780394500874. Duran, Pr. Diego. Historia Antiqua de la Nueva Espana. Madrid: Antiqua Libreria de Andrade y Morales, 1585. Frazer, J.G. Folk-Lore in the Old Testament. New York: Macmillan, 1918. Ixtilxochitl, Don Ferdinand d'Alva. Historia Chichimeca. 1658. Kingsborough, Lord Edward King. Antiquities of Mexico. Puebla, Mexico: Benemèrita Universidad Autònoma de Puebla, 1996. Kirkpatrick, Betty (ed.). Brewer's Concise Dictionary of Phrase and Fable. London: Cassell, 1992. ISBN 9780304340798. Kohl, Johann Georg. Reisen in die 'Ostseeprovinzen. Dresden: U. Leipzig Arnold, 1842. Pennock, Robert T. Tower of Babel: The Evidence Against the New Creationism. Cambridge, MA: MIT Press, 1999. ISBN 9780262161800. Rawlinson, George (ed.). The History of Herodotus. New York: D. Appleton and Company, 1885. Readers Digest. The World's Last Mysteries. Pleasantville, N.Y.: Reader's Digest Association, 1978. ISBN 9780895770448. Is there archaeological evidence of the Tower of Babel?-Christian Source. Tower of Babel envisioned by science fiction artist Frank Wu. History of "Tower of Babel"
This page was last modified on 17 December 2015, at 19:58.